Filing for divorce involves filling out a petition, summons and any other forms your court requires, paying the required fees and serving the papers on your spouse. The thought of navigating the filing process without the aid of an attorney can be scary. However, over the past several years, courts have put tools in place to guide you through the process so that you may confidently file for divorce pro se, or without an attorney. Many courts have online family law self-help portals that outline the steps you must take in your state to file for divorce. This section may also tell you if your circuit provides centers where you can go for one-on-one help with choosing and filling out divorce forms, and even sign up for how-to seminars on filing for divorce without an attorney. Not all courts provide notice of these services online, but if they are available in your area, the court clerk can tell you over the phone. Ask for help locating the nearest self-help center, and contact a representative by phone or in person if you have questions during the filing process. 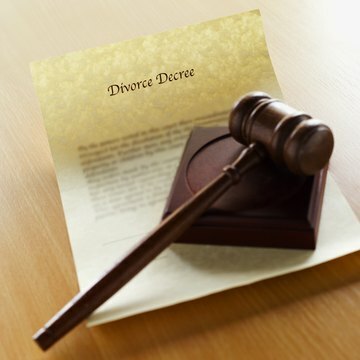 The first thing you need to know is where to file your divorce petition. States specify by statute how long you or your spouse have to live in the state before you can file your divorce in that state's courts. Florida requires a residency of six months; Nevada requires six weeks. Learn your state's residency requirements by calling your court's self-help center or checking your state's statutes. If you haven't lived in the state long enough, you must file in your previous state of residence. You have to identify what state has jurisdiction over your divorce because you must follow that state's filing process. Form packages are usually available for download from your court clerk's website, or in hard copy from a self-help center. Select the forms package that fits your situation. For example, there is a different package for an individual with no property or children than a person with them. Detailed instructions come with these packages, which list the forms included and explain which ones are required for the initial filing process. The petition for divorce, although it may be named differently in your jurisdiction, is primary, as it announces the divorce. Also generally included in the initial filing paperwork is a summons, which is served on your spouse with the petition, notice of Social Security number, which places your Social Security number on record with the court, and a notice of related cases, which lets the judge know if there are any pending cases involving you and your spouse that should be heard at the same time as the divorce. Standardized forms may not cover all situations. If your divorce involves complicated issues, such as psychological custody evaluations, high dollar assets or domestic violence, you may need documents professionally drafted to fit your specific situation. Included on many court websites is a list of fees charged by the court. Included is the fee for filing a petition for divorce. There will also be a fee for using the local sheriff's office or a private process server to serve your spouse with petition and summons. If you cannot afford these fees, you may ask for a waiver. An affidavit of indigency is available from the family law clerk's office. Fill it out with the requested financial information and hand it back to the clerk. In some jurisdictions, such as Florida, the clerk can usually determine eligibility right then. Other jurisdictions have different criteria and the determination may take some time. If you are already qualified for services such as food assistance, you may qualify automatically. If you are granted a fee waiver, your filing fee and sheriff's office service fee is waived, as may be any notary fees if notarization is performed by the court clerk. Once you complete your petition and summons forms, and any other forms your court requires you file with the petition, you may decide to make an appointment with a self-help center, if one is available, for a staff member to look over the paperwork. These individuals are not attorneys and do not give legal advice, but they can explain procedure and identify any deficiencies in your forms. When you are satisfied the papers are complete, they must be filed with the family law clerk. The petition and summons must be served on your spouse by the sheriff or a professional process server. Fee waivers only apply to service by the sheriff's office. Once the papers are presented to the sheriff or process server, he takes and delivers them to your spouse. He then files a return of service with the clerk as proof that the papers were delivered. Your spouse can agree to accept service and sign an affidavit to avoid being served in most jurisdictions. Although filing for divorce while incarcerated poses a unique set of challenges, the process itself is the same for all Ohio residents, including inmates. Although the process may be time consuming, by using readily-available resources, following prison procedures, and meeting Ohio's statutory requirements, inmates can successfully navigate the legal system and ultimately be granted a divorce. How Do I File My Last Will & Testament in Court?